HOUSTON - Astros FanFest may be sold out, but if you play your cards right, you may be able to join the thousands of orange-clad rowdies at Minute Maid Park on Saturday. 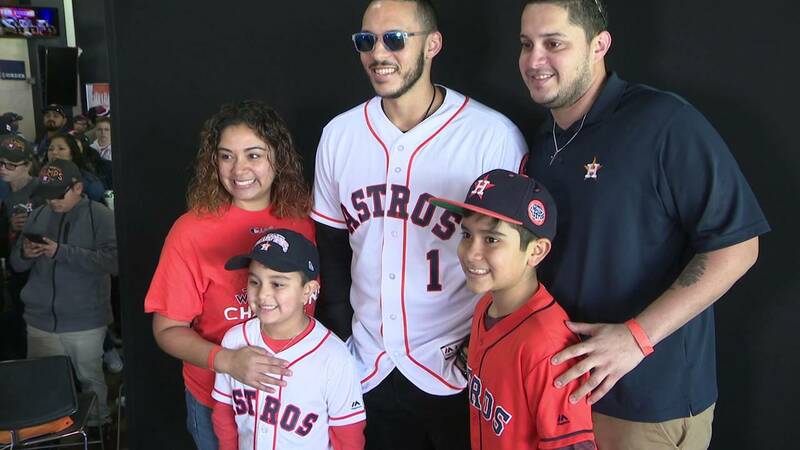 All free online vouchers have been claimed, but a limited number of vouchers were available at Minute Maid Park on Saturday. FanFest kicked off with a Question and Answer session with pitcher Justin Verlander. A new Astros Hall of Fame was unveiled at FanFest. The festival will run from 11 a.m. until 4 p.m. The following information is on the Astros' website. Designated parking will be available in Astros Parking Lots A, B and C for free. Parking will be available in the Raymond James - Alex Brown Diamond Lot South for Season Ticket Holders on a first-come, first-served basis. Due to construction, the Diamond Lot will only be accessible from Preston Street. The Texas Avenue entrance will be closed. Fans can enter FanFest at the Atrium, South Homeplate, Right Field Gate, Center Field Gate or Left Field Gate. Due to construction, the STH gate and Clock Tower entrance will be closed for FanFest. Please note that all vouchers are digital tickets only. You can download the MLB Ballpark App to access your FanFest admission and activity vouchers. Screenshots of admission tickets and/or activity vouchers or a print out of the confirmation page will not be accepted. Admission tickets and/or activity vouchers cannot be resold, returned, refunded, transferred or exchanged for any other consideration. This policy will be strongly enforced and violators may be asked to leave or denied entry. Must have your Buddies membership badge displayed for these exclusive benefits. Get to know your Astros players and gain insight into the inner workings of the Houston Astros organization. Below is the tentative schedule for the fan forums. Check back for a finalized schedule of fan forums that will take place in the Raymond James - Alex Brown Diamond Club during FanFest. Fan forums are free to attend. Please note: Access to the Raymond James - Alex Brown Diamond Club for the event will be at the right field gate ramp due to construction at the Clock Tower.